The men’s hockey team greeted two well-known foes on the ice at Spurrier-Snyder Arena this past weekend. On Friday night, the Cardinals forced a 3-3 tie against Middlebury before falling to Williams 4-3 on Saturday afternoon. Following the weekend action, the team’s record now stands at 2-10-8, with a 2-5-7 record in NESCAC action. 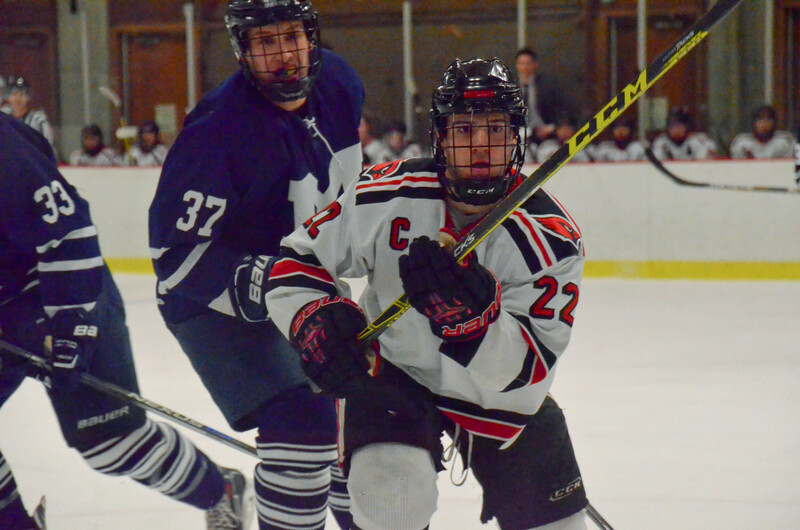 The Cards currently sit in 8th place in the NESCAC, with a crucial weekend road trip looming. Netminder Dawson Sprigings ’17 discussed his thoughts on the team’s performance this year. Middlebury jumped out to a quick lead on Friday night, scoring on its first shot of the game a mere 30 seconds after the puck had dropped. The Panthers’ Kamil Tkaczuk deflected a shot past Sprigings for the early lead. Just four minutes later, Middlebury’s Mark McLellan beat the Wes goaltender once again to put the Panthers up by two. 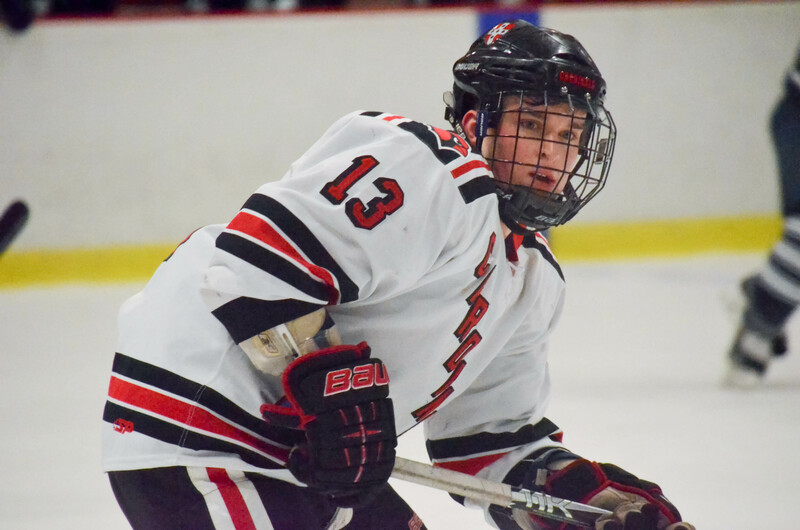 A back-and-forth struggle ensued before the Cardinals were able to answer when Terence Durkin ’16 deflected a Cole Morrissette ’17 shot into the back of the net. Cam McCusker ’18 picked up the secondary assist on the goal. Middlebury would take the 2-1 lead into the locker room for the intermission before opening the scoring in the second period. The Panthers’ Evan Neugold found twine to give his side a 3-1 advantage. Middlebury would hold the momentum until midway through the period, when their starting goaltender Stephen Klein exited the game with an apparent injury; he was replaced by Liam Moorfield-Yee. Captain Jay Matthews ’16 would quickly take advantage of the opportunity when Wesleyan was given a two-man advantage. Matthews sixth goal of the season found the back of the net off a feed from Chad Malinowski ’19 and cut the Panther lead in half. The score held until the third period, when the Cardinals appeared to tie the game at three. 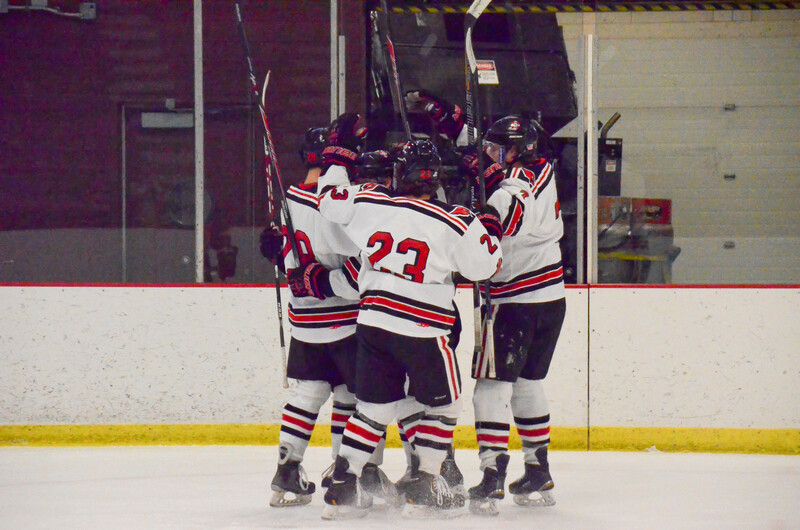 However, the goal was waved off, and Middlebury maintained the advantage until the Cardinals evened the game again midway through the period, this time for good. Jaren Taenaka ’16 fired a shot past Moorfield-Yee off a feed from Andy Espinoza ’19. After a scoreless battle in overtime, the game ended in a 3-3 tie. In a quick turnaround, the Cardinals took the ice again on Saturday afternoon for a Little Three matchup against the Ephs. Taenaka struck for the Cardinals’ second consecutive goal when he opened the scoring in the first period. Alex Carlacci ’16 recorded an assist on the play. Minutes later, McCusker gave the Cardinals a 2-0 lead on a shot assisted by Morrissette and Durkin. This was the third time this season that the Cardinals have scored twice in the opening frame. Wesleyan held the lead until Williams answered just over seven minutes into the second period when Roberto Cellini was able to beat Sprigings. The Ephs would score again four minutes later, when Greg Johnson hammered home a Frankie Mork pass past Sprigings. Williams would take a penalty for having too many men on the ice late in the period, giving Wesleyan the advantage. However, Williams scored a shorthanded goal for a 3-2 lead. After the second intermission, the Ephs scored their fourth consecutive goal of the afternoon when Cellini scored his second of the day at the 7:17 mark of the final period. With just over five minutes remaining in the game, Wesleyan’s Vince Lima ’19 beat Williams netminder Noah Klag to cut the lead to one. However, the Cardinal comeback would fall short, despite pulling Sprigings with under a minute to play. Wesleyan could not tie the game and fell by a score of 4-3. After the contest, the Wesleyan goaltender analyzed his performance for the 2015-16 season. Sprigings continued to explain in-depth about what it means to him to suit up between the pipes every game for the Red and Black. NESCAC action continues for the Cardinals this weekend with a trip to Brunswick, Maine to take on the Bowdoin Polar Bears.